Most companies are investing in Machine Learning, yet very few are currently deploying Machine Learning models throughout their organizations. The Enterprise AI Layer sets the gold standard for companies who are serious about their AI/ML investments. It’s simple. Git push your pre-trained model, algorithm, or function in the language of your choice—and a few seconds later you have an API endpoint ready for front-page of Reddit scale. The amount of development time that goes into deploying ML models at scale is restrictive. 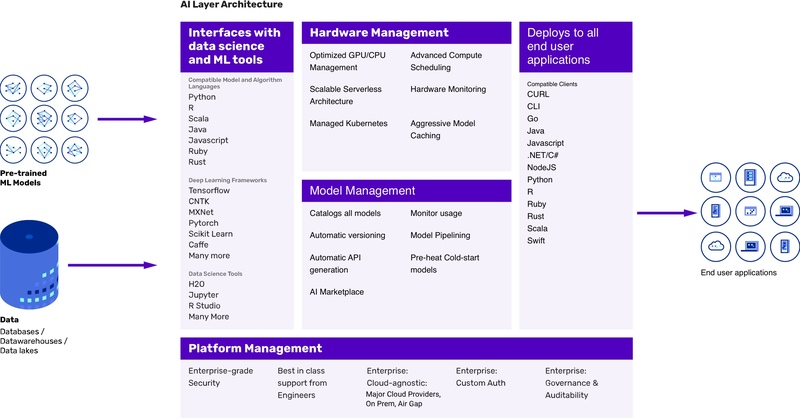 That’s why biggest tech companies like Uber and Google have built their version of the AI Layer; Algorithmia makes these powerful tools available to everyone. The AI Layer organizes your entire library of AI/ML Models, functions, and algorithms—making them discoverable based on your own permissions. Dashboards and logs help you understand how models are being used across your organization, and help you plan and allocate resources. Your hardware is being optimized behind the scenes—it’s going to be fast, scalable, and ready for any challenge your team takes on. Behind the scenes the AI Layer is making sure that your legacy models can continue to run without breaking any endpoints. Data Scientists can deploy the models that they’ve already built, in the language of their choice, in just a couple of minutes. The Enterprise AI Layer removes coordination costs, increases model iteration speed, and allows data scientists to continuously ship and improve models. No more waiting months on engineering teams to deploy the models you’ve already worked so hard on. See all the languages we support. The AI Marketplace has over 5,000 pre-trained ML models, algorithms, and functions available for you to incorporate into your data pipelines. Stay competitive by making your applications AI-capable. You wouldn’t ask your graphic designers to merge pull requests—so why should your Data Scientists be worrying about DevOps and model deployment? Let them focus on what they do best: keeping up with the rapidly progressing field of data science and building awesome models. For the first time ever, you can leverage powerful GPUs working in parallel while only paying for the seconds you’re actively running models. Our engineers have spent years building the ideal ML infrastructure—squeezing out maximum performance at minimum cost. The AI Layer will run each of your models in parallel and automatically pipelines the results together. Huge jobs can be performed quickly. Compute for ML models is extraordinarily spikey. The Serverless Artificial Intelligence Layer will scale up and down by the second. You get the performance you need with none of the work or cost of managing the hardware. Our team of ML infrastructure specialists are here to ensure you have a plan to deploy your ML investments. Schedule an initial meeting with our team today.